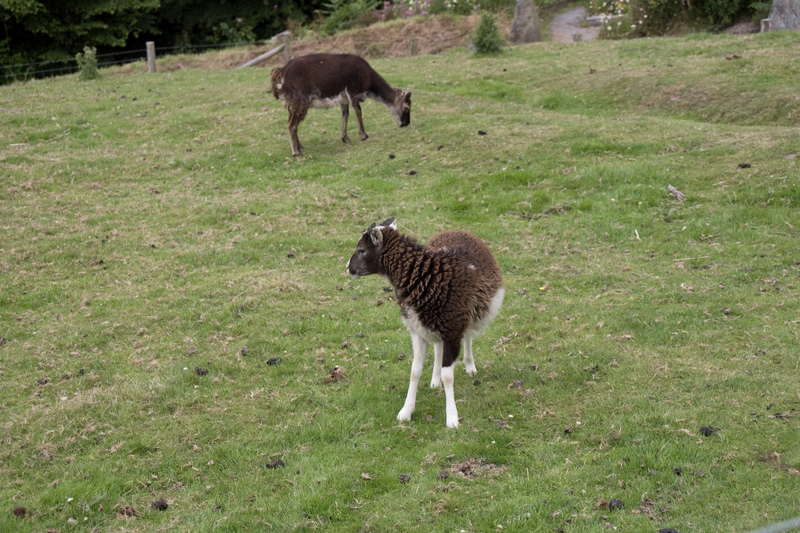 If you missed Part 3 of our seafaring adventure to Ramsey Island, you can catch the next boat here. Castell Henllys (Welsh: Castle of the Old Court) is a reconstructed Iron Age fort situated between the towns of Newport and Cardigan in North Pembrokeshire. 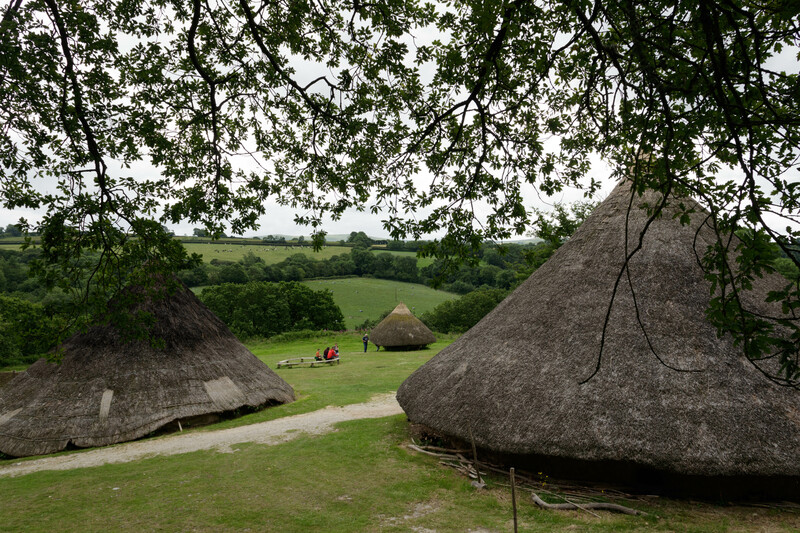 The fort has been the subject of significant archaeological excavation for the last 26 years, and the only Iron Age village in Britain to be reconstructed on the exact position of the original roundhouses our Celtic ancestors lived 2300 years ago. After parking our Scottish chariot in the car park, we set off to buy our tickets at the visitor centre. The staff helpfully answered all of my questions about other prehistoric sites in the area we were considering visiting – from the neolithic burial chambers of Pentre Ifan and Carreg Coetan Arthur to the standing circles of Bedd Arthur and Gors Fawr tucked away between the knuckles of the Preseli Hills. I knew we wouldn’t be able to fit in all of the local landmarks in our short week, but I was gutted to learn that to get to Bedd Arthur (Grave of Arthur) – a group of 13 standing stones that overlook the rocky outcrop of Carn Meini – we’d have to cross a boggy marshland. Of course, none of us thought to bring wellies. 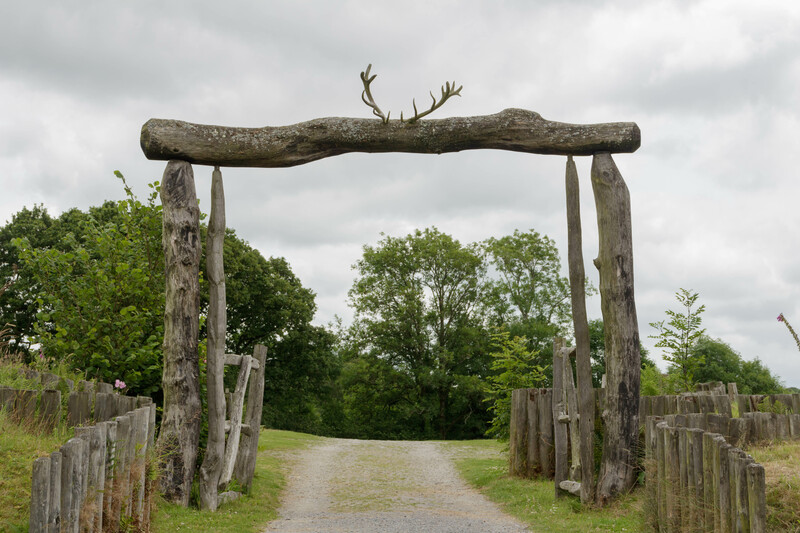 Oh well, at least our next visit to Pentre Ifan won’t require a change of footwear. Hubby, on the other hand, looked suspiciously relieved. Later, he confessed he didn’t like the thought of me going near a stone circle in case I disappeared. That’s what comes of introducing him to Outlander. 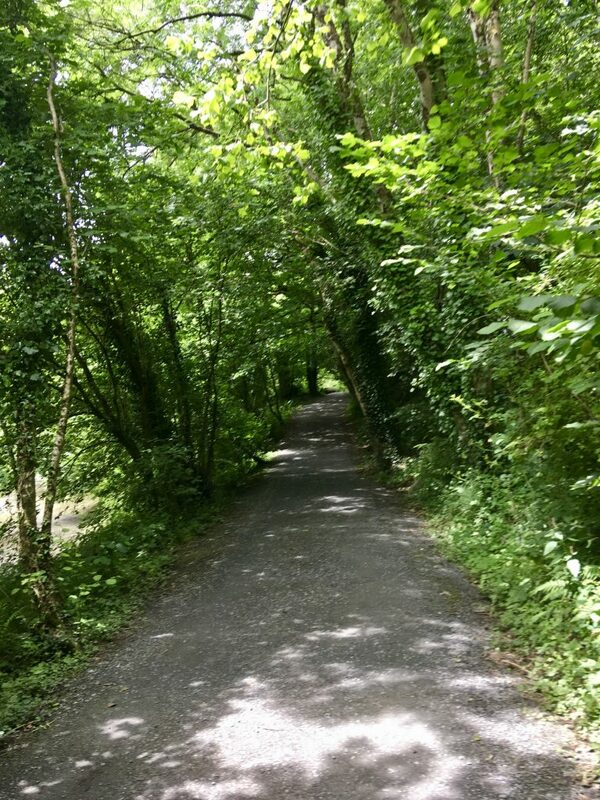 From the visitor centre, we followed the peaceful woodland trail that takes you through part of the Pengelli forest, one of the largest areas of protected ancient woodland in West Wales. 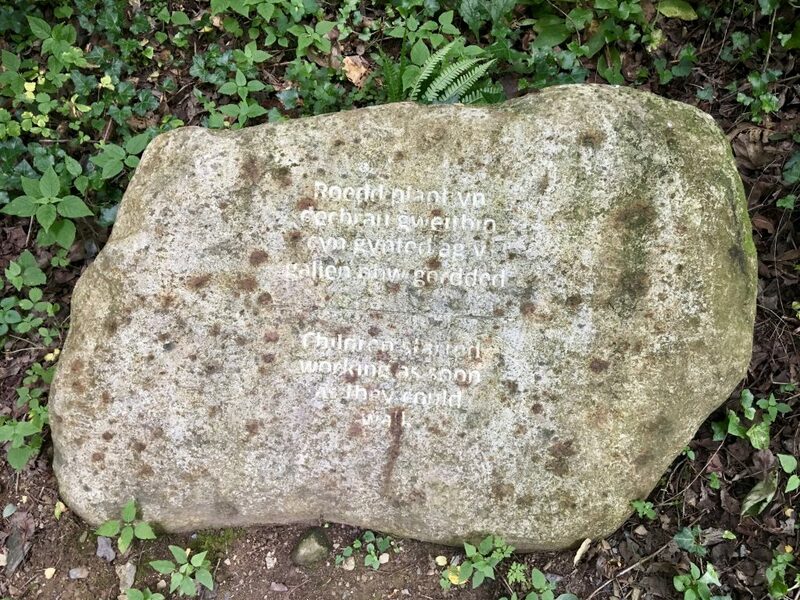 As we strolled under the leafy canopy of oak, alder and willow trees, soothed by the sound of lapping water from the river Duad and echoing bird song, we didn’t spot any blue tattooed Celts lurking amongst the ferns and shrubbery, but we did pass various stone markers inscribed with interesting facts about the lives they once led. Inscription reads: Children started working as soon as they could walk. Wish I’d seen this 15 years ago. The hill fort is situated on a natural headland with steep slopes on three sides and one approach from the north west. 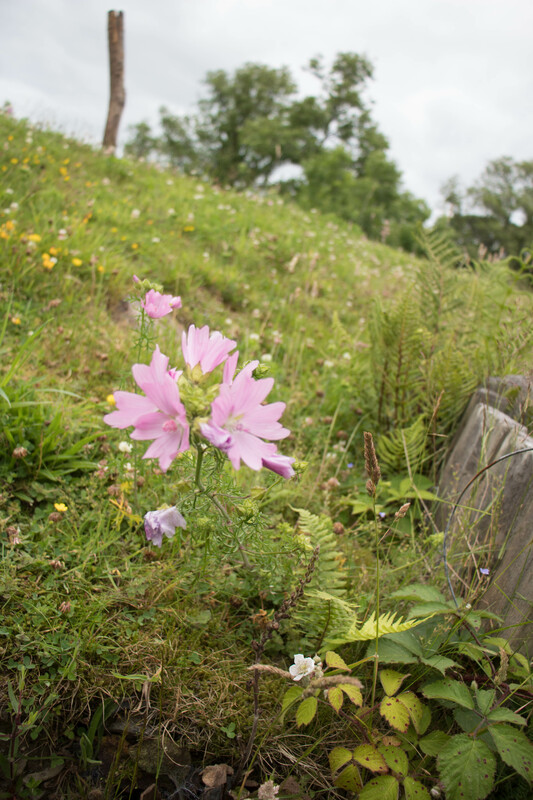 Originally, the hilltop would have been surrounded by a ring of inner and outer timber ramparts and ditches to provide a vital defence against rival clans. It’s been suggested from the impressive scale of the hill defences and the llys part of the fort’s name (meaning palace or court) that Castell Henllys was once a high-status home for the Demetae tribe. Every summer, local archaeology students come here to participate in the continuing research and excavation training programme run by York University. 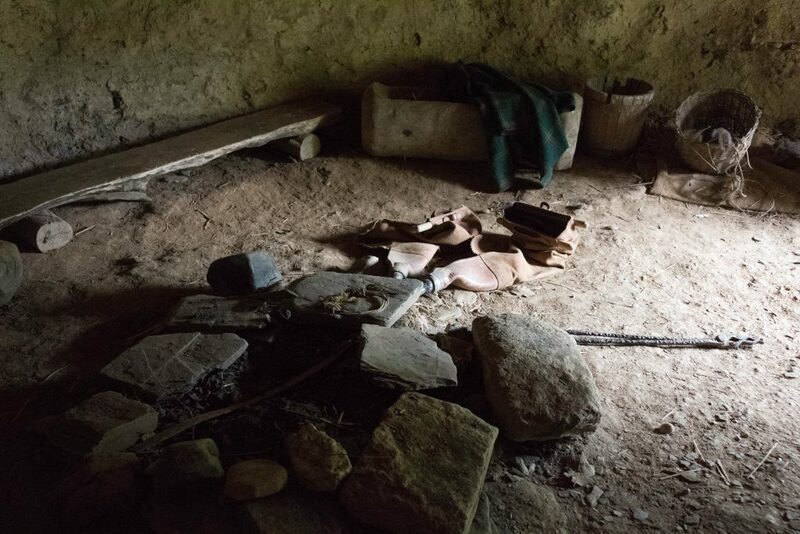 Excavation of the original roundhouse foundations has revealed post holes, floors, hearths and other significant finds dating from between 500 to 100 BC. Radiocarbon dating of roman artefacts unearthed from the farmstead adjacent to the fort confirm the hill was also occupied during the Romano-British period. Another important find was the large hoard of slingshots discovered behind the outer ramparts, along with various other artefacts within the grounds of the fort, such as carbonised bone, iron objects, pieces of pottery, glass beads and spindle whorls, all of which provide a valuable insight into the living conditions of the people who lived and worked here. After we’d trudged to the top of the slope, our first glimpse of Iron Age life fortunately wasn’t a barrage of pebbles raining down on our heads, but came in the shape of two mammoth pigs chomping away under the shade of a tree. 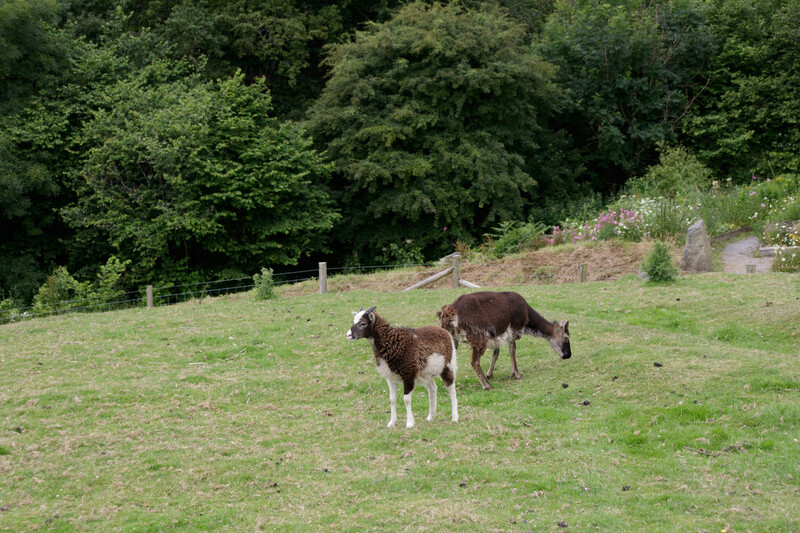 And, in the field opposite, a group of skittish goats who took off seconds after I clicked the pic below. A rustic gateway, complete with a pair of mounted stag antlers led us into the now deserted fort. Two thousand years ago, this would have been home to a thriving community of around 100 people. Sadly, the only ancient Celt you’re likely to see today is the odd member of staff donned in Iron Age attire, entertaining groups of over-excited school kids. Although the site seems to be aimed primarily at school children, who are invited to take part in special educational events throughout the year, it also gives visitors of all ages the opportunity to experience first hand what daily life would have been like during the Iron Age. I admit, the big kid in me was itching to have my face painted in blue woad along with the other kids who were taking part in a reenactment while we were there. But knowing we had to stop off at the supermarket on the way home, I managed to resist the urge. 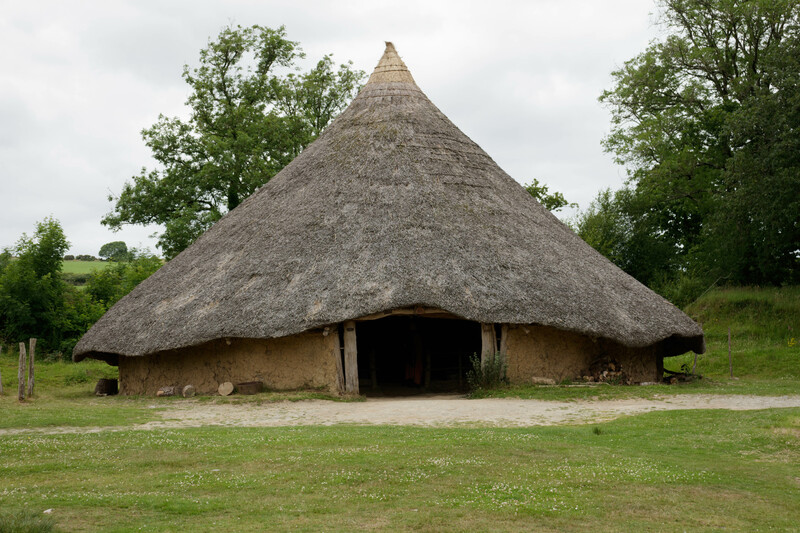 The roundhouses at Castell Henllys have been reconstructed using archaeological evidence found at the site. 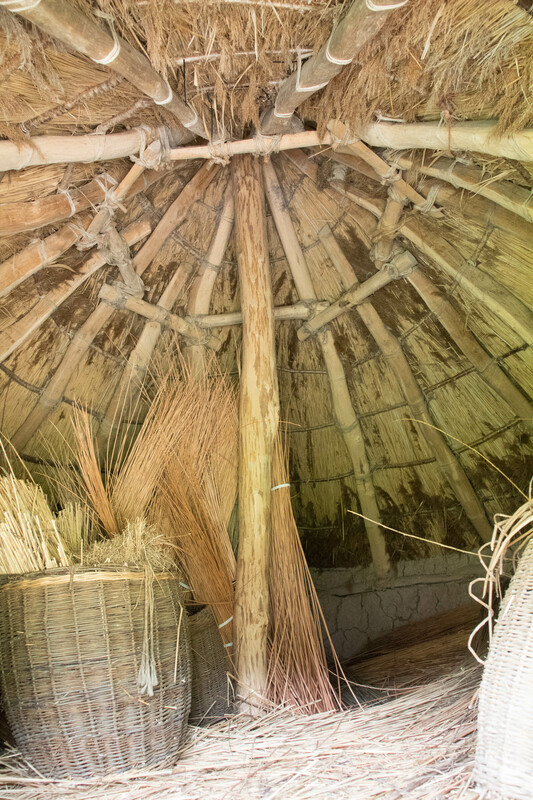 From the size of the surrounding banks and ditches, it’s thought many of the original roundhouses were quite roomy inside. 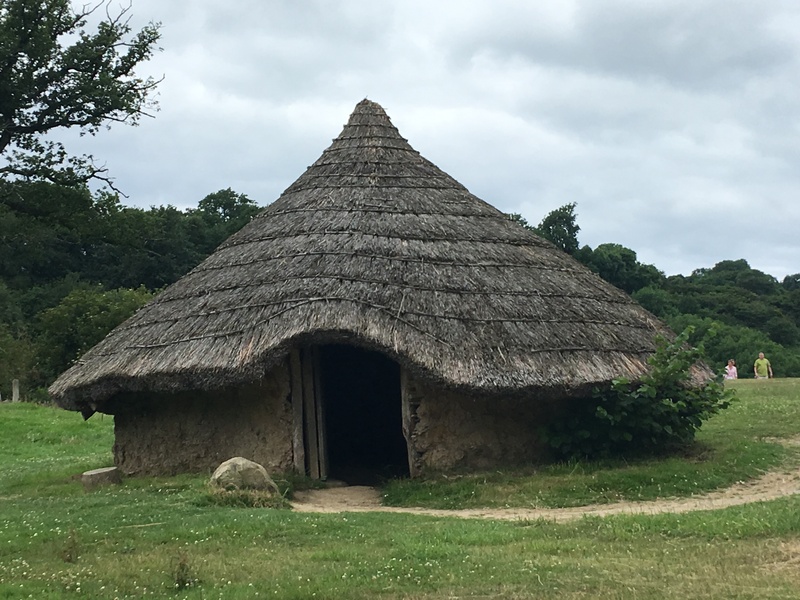 The granary and Old Roundhouse (Roundhouse One) were first to be built in the early 80s and are the oldest recreated prehistoric buildings in Britain. The Old Roundhouse has a diameter of 33ft, and unlike its two counterparts, was constructed with an inner ring of timber posts. 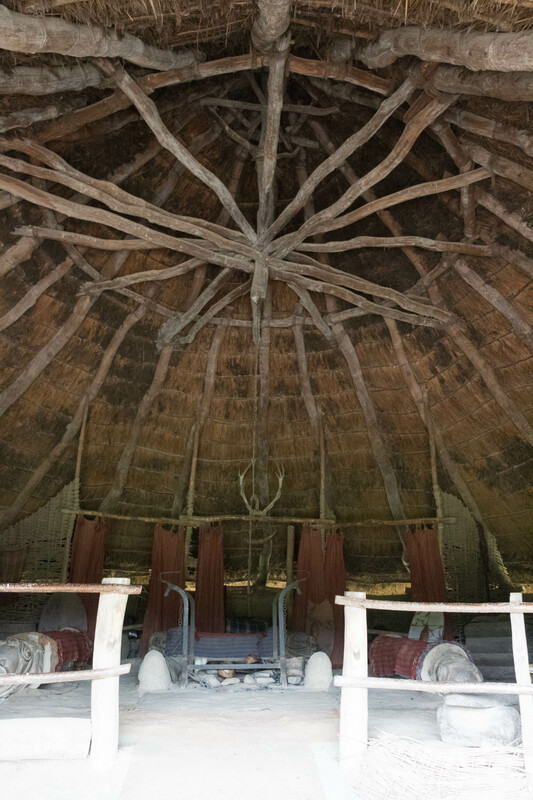 The biggest of the roundhouses, completed in 2000, measures 42ft in diameter and is believed to have belonged to the chieftain and his family. 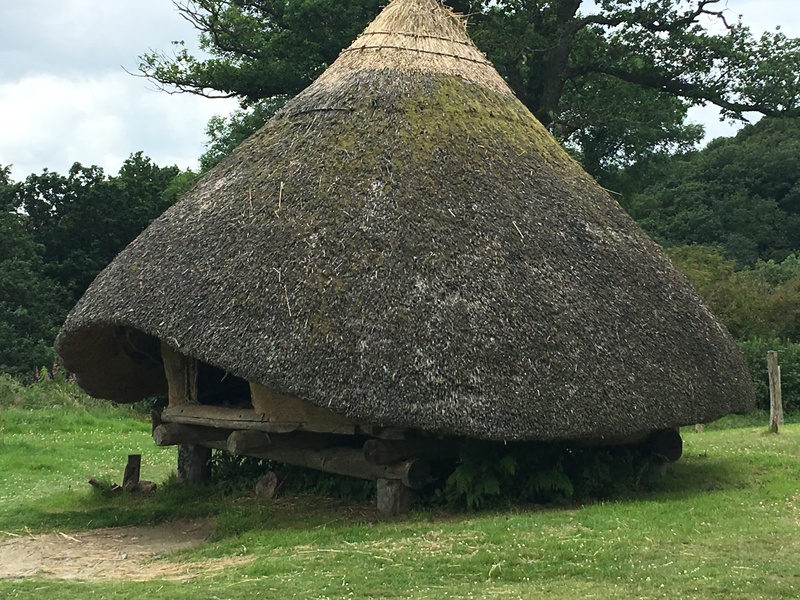 All three roundhouses are constructed from a series of upright timbers, interwoven with coppiced wood such as pliable hazel and willow sticks to make the wattle walls. 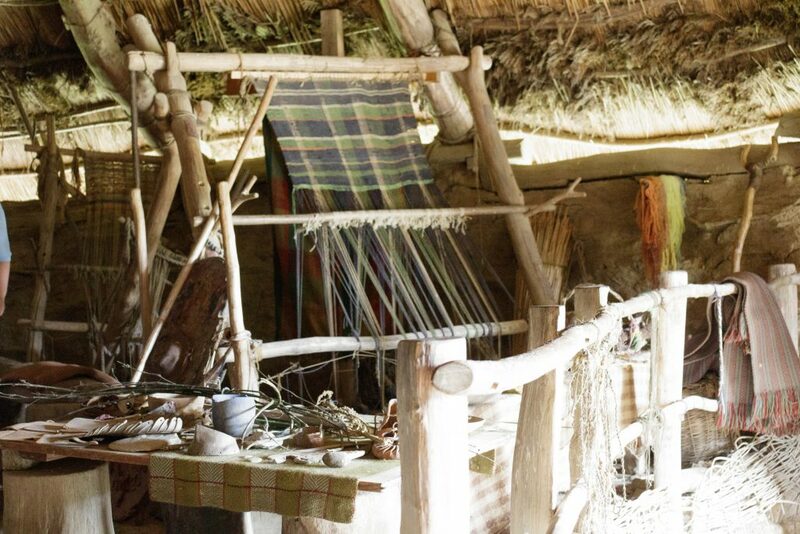 These are then covered with a mixture of clay, straw and animal dung to keep the house insulated, wind and watertight. The timber posts supporting the densely thatched roof have been placed in the original post holds and are sloped at 45 degrees to encourage rain and snow run off. 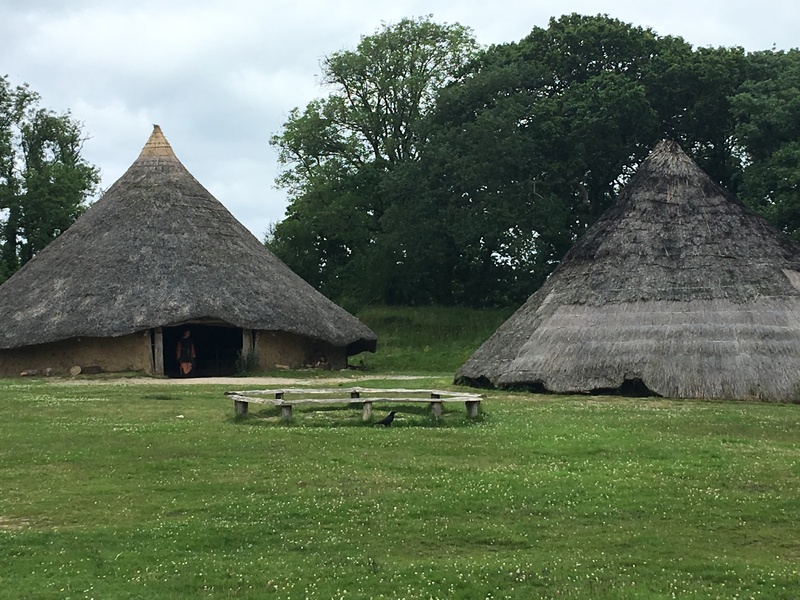 Just like any modern house, the roundhouses at Castell Henllys require periodic repairs to prevent structural damage and conserve this important site for future generations to enjoy. It’s possible that with regular maintenance an Iron Age fort may have lasted a hundred years. 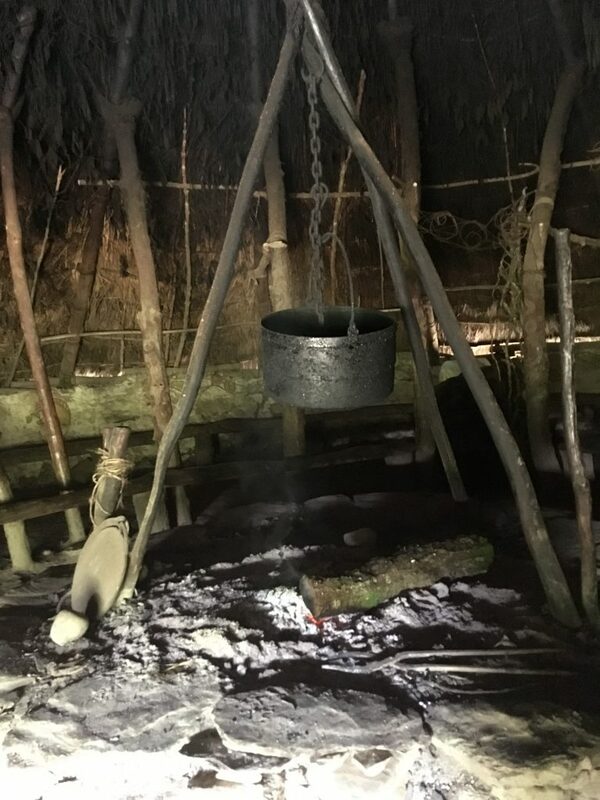 Stepping into the smoky gloom, my eyes were immediately drawn to the central hearth where a great iron cauldron hung from a wooden tripod, similar in type to those used during the later Viking era. As I sat on one of the beautifully carved log seats, trying to absorb all the fascinating interior features, I could almost imagine the tribe gathered around the fire of an evening, singing songs and telling epic tales of old before they retired to the comfort of their hay-filled beds, which actually looked remarkably cosy layered up with animal skins and woollen blankets. Of course, the fire didn’t only provide much needed warmth and light inside the dingy roundhouse. It was a requisite for roasting meat or making simple broths and porridge, and would have been kept lit day or night. The smoke from the fire also acted as a useful deterrent against vermin and helped to preserve meat and dry herbs that hung from the rafters. 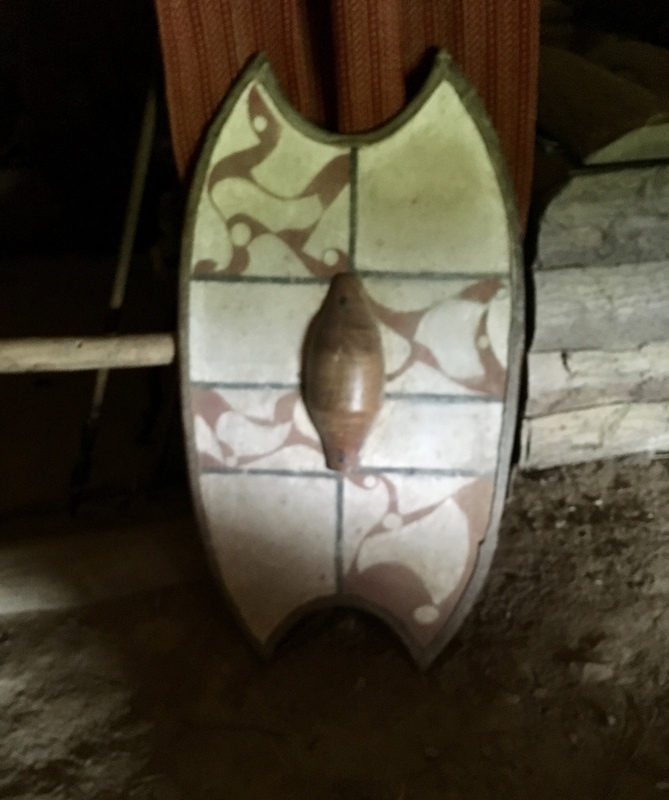 Harvested crops were ground into flour using stone querns and made into flat bread, which would be baked either on the fire or possibly in a clay-domed oven. 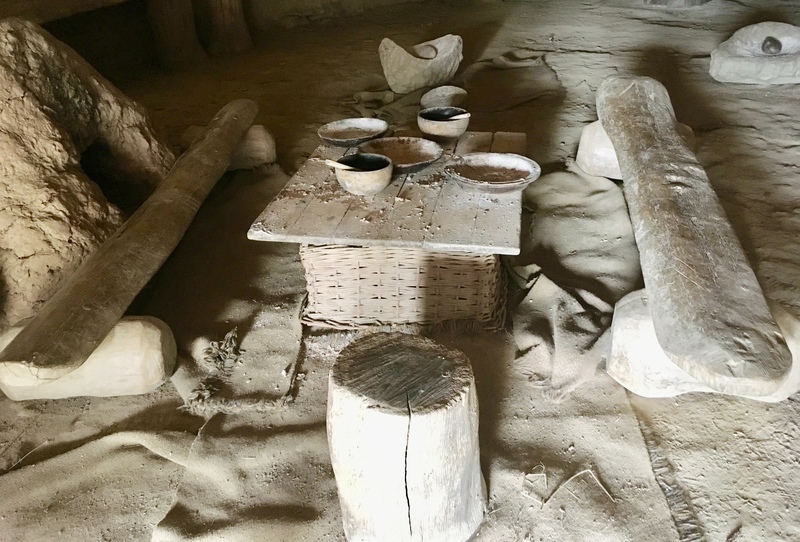 The cooking pots and crockery you can see on the makeshift table were made from clay or carved from wood. Any leftover grain was used for animal fodder or fermented into beer. 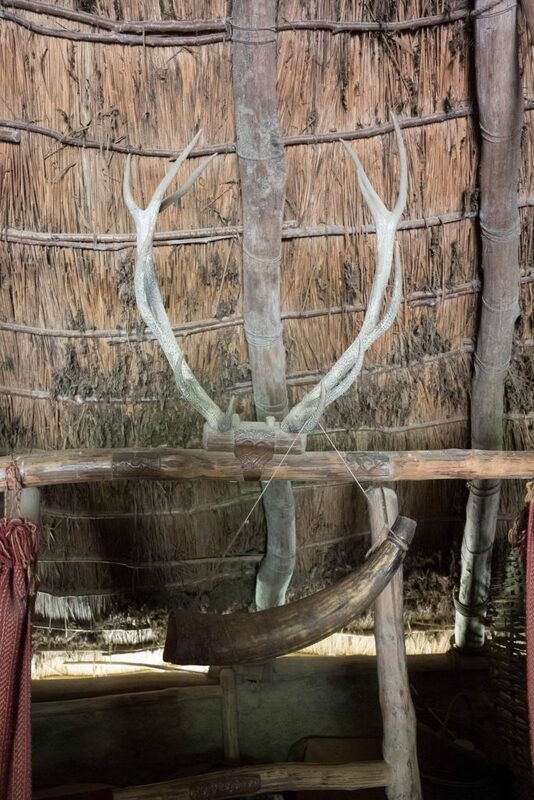 Drinking horn made from an auroch horn. In comparison to the thousands of mass-produced clothing and textiles Chinese factories churn out every day, one hand woven Iron Age garment might take several weeks to make. Bog iron collected from the local marshes and heated over an open fire could be made into useful farming tools, spears and daggers. Many of the bronze, copper and iron materials were forged by a visiting blacksmith, who kept his skills a closely guarded secret. To these ancient people, the smith’s mastery of fire was akin to magic. 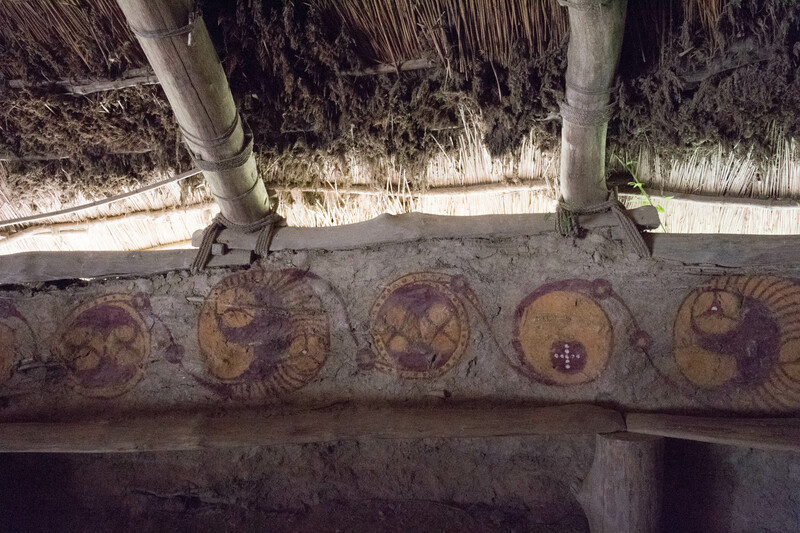 Other objects of higher value such a brooches, hair pins, torc bracelets and necklaces decorated with complex triskelion symbols and animal patterns would have been reserved for the heads of the tribe as a demonstration of their wealth and power. Iron Age forge. The double bellows made from cow bladder allowed the heat to be increased to the correct temperature for smelting the ore. 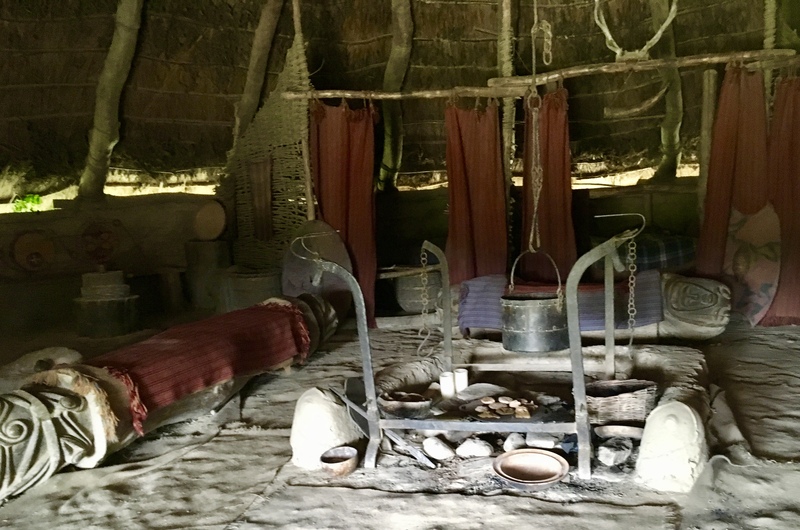 I think what struck me the most – apart from the fact my sons were amazingly more mesmerised by the flames of the open fire than their iPhone screens – was how self sufficient and resourceful the ancient Celts were. 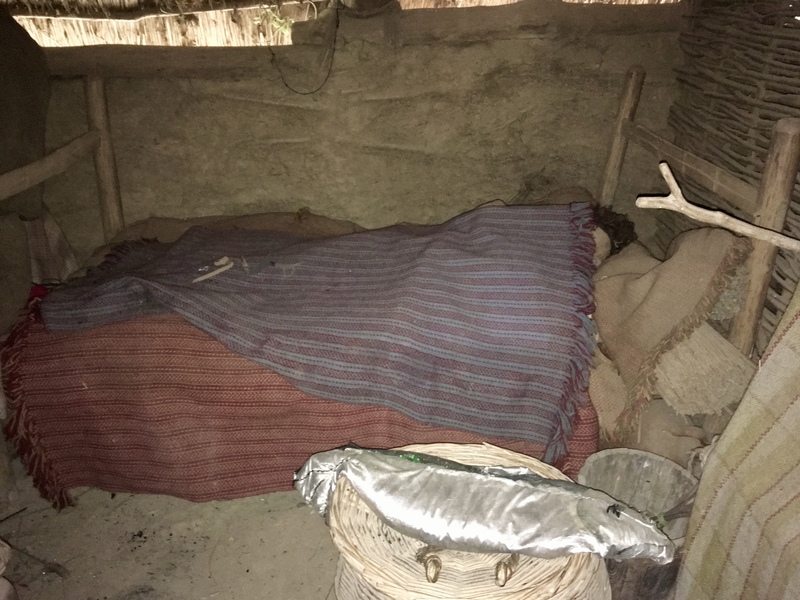 They cultivated their own crops, reared livestock, and what they couldn’t grow or butcher they would forage from the surrounding rivers and woodland. Nothing would be wasted or thrown away. 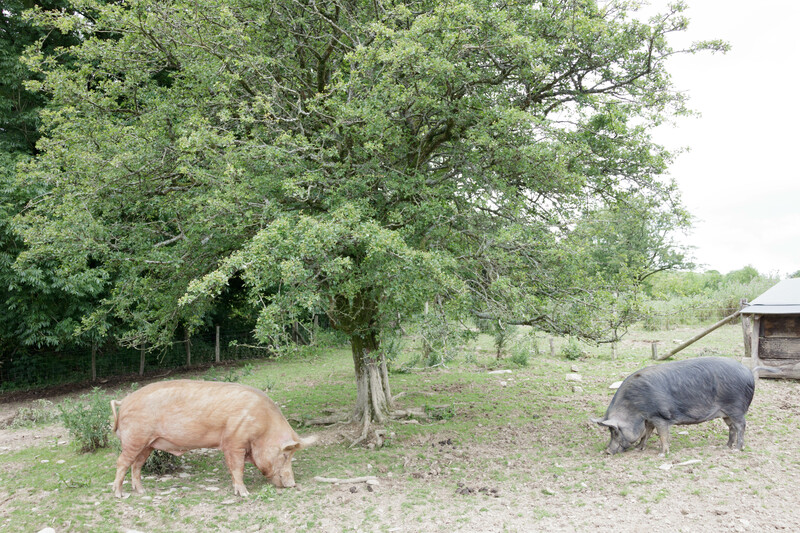 Spoiled food or scraps would be given to the pigs and cattle, tools and clothing would be repaired and manure used to fertilise the fields and build their houses. 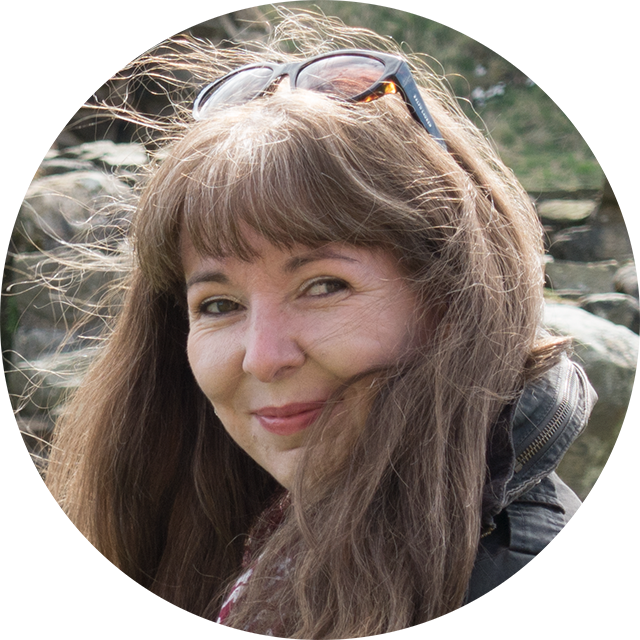 There was something about this simple, sustained way of living I found quite appealing, although I’m sure the novelty would quickly wear off without a WI-FI connection or more importantly – a toilet. With our lungs crying out for fresh air, we headed back through the forest. Thankfully, the eau de bonfire smell had almost worn off by the time we reached the visitor centre to sample the delights of the cafe. Works like a charm when you’re trying to bribe teenagers to visit historical attractions. 😉 Not that I need any persuasion to indulge my cake addiction. 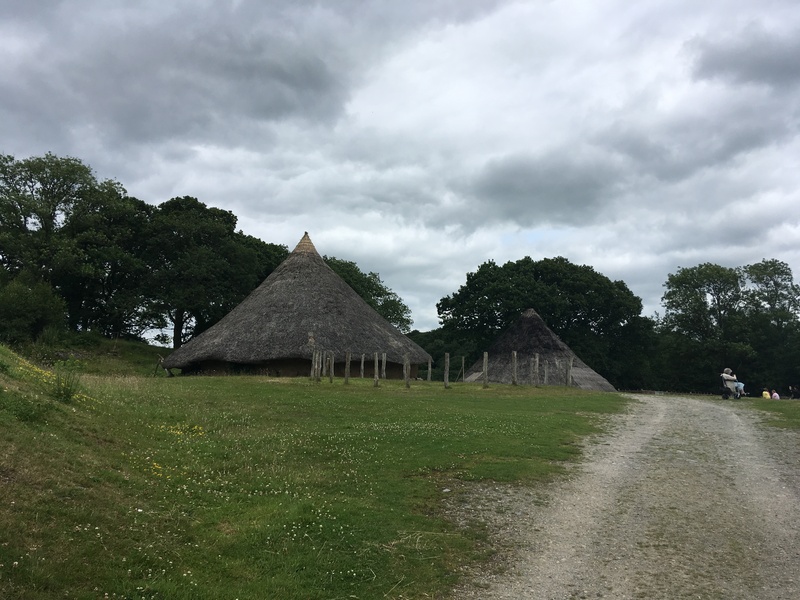 There’s also a small gift shop, an educational area with interactive exhibits about the hill fort and an outdoor play area to keep younger kids entertained. Alternatively, there are plenty of picnic spots outside if you want to bring your own sandwiches. 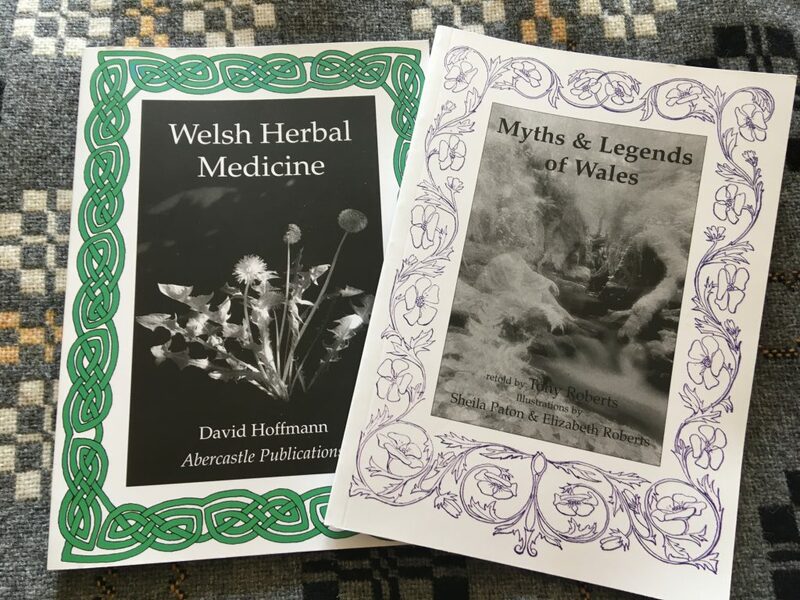 Once I’d taken the obligatory browse around the gift shop, I bid Castell Henllys farewell with a cosy woollen blanket under one arm and these Welsh reads under the other.